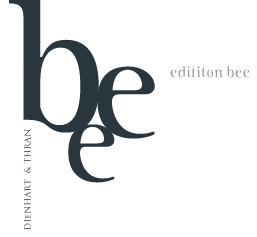 edition bee – the idea of the first-class Riesling with the built-in good cause. Winegrower meets wine freak – just like that – and we understand each other immediately. With the edition bee, we, i.e. Timo Dienhart and Andreas Thran, want to make our mark in the field of top Rieslings from the Moselle. Pure pleasure from outstanding steep-slope Riesling, organic cultivation and, to top it all, active protection of creation – we want to make our vineyards a refuge for bees. The idea was born in the unique location of “Honigberg”, the Honey Mountain, when, while walking through the especially greened vineyards, we noticed the buzzing of the bees underneath the heavily laden vines. “Have you heard about how endangered the bee is? One of the most important pollinators in the natural cycle – people are already talking about a major bee extinction.” An idea which soon gave us the name – edition bee. For this reason, a particular focus in the greening of our vineyards is, alongside the vines themselves, the bee. With special additives to the “power seeds” for the perfect Riesling, we create blossoming habitats between the rows of vines. With every drop of edition bee wine you are supporting our work in maintaining and expanding the important habitat of the bees on the Honigberg.